We’ve all heard rumours about the old man with a low kilometre classic motorcycle in his garage gathering dust; but go for a look and nine times out of ten it’s what a real estate agent calls a ‘renovators delight’, that’s industry code for crap. 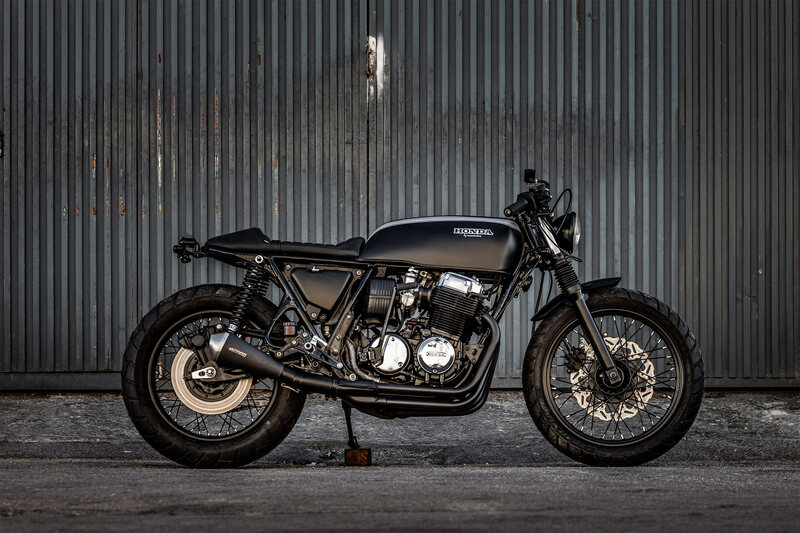 But when Spain’s kings of custom, Jose and Tito from Macco Motors, found just such a ride it was the rare exception; a 1976 Honda CB750 with only 8000 km on the clock. 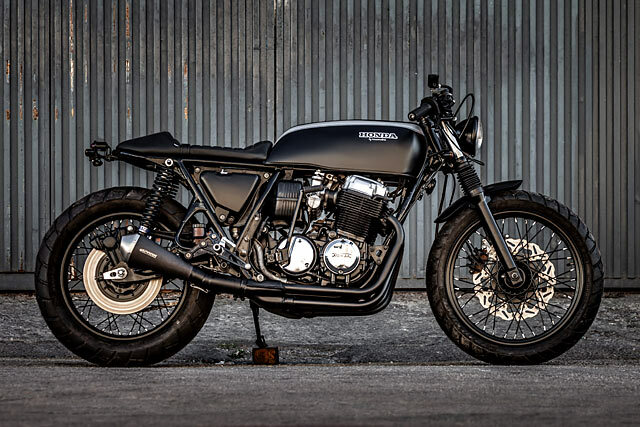 The negotiations were monstrous, but the results speak for themselves, another killer cafe racer they call Chimera. 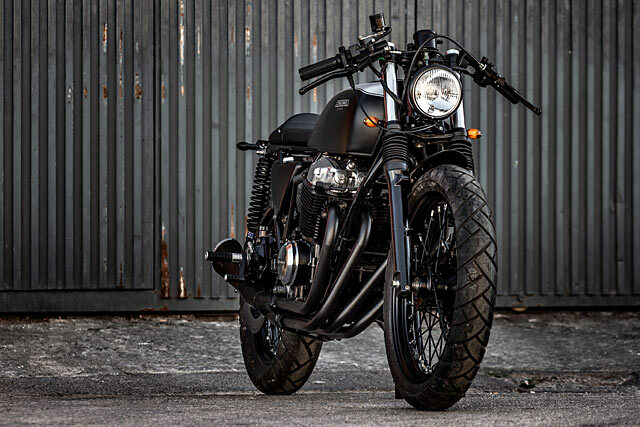 With a thriving business and a backlog of commissioned builds waiting in the wings, it’s a rare day for the successful duo that they get out of the shop. With bikes now coming to them its been some time since they last ventured into the world of tyre kicking, but the tip-off was a good one. The Honda had been bought in the man’s youth, travelled to the Canary Islands with him and then when family duties became too much, parked up more than 15 years ago. But with fond memories of his youth infused into the CB’s fabric and the old engineer knowing well he was sitting on a good thing he wouldn’t give it up without a fight. 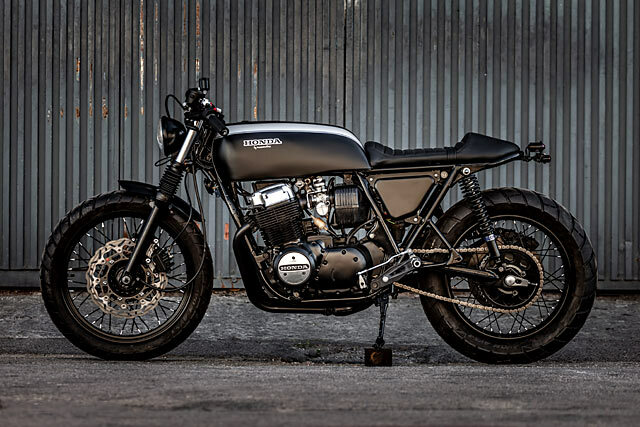 But after plenty of hand waving, chin scratching and the appropriate number of Euros folded up, the Honda was on the trailer and headed for Macco Motors. The boys decided with such a find they’d do the build in two stages; first restore the ’76 to its former glory and then once they had a good clean runner, make the subtle changes to complete quality custom. Pulling the CB down they were surprised to find that despite its four decades of life and having crossed the ocean the bike was in relatively good shape. The only part showing any serious signs of age were the fork stanchions that had turned a nice brown thanks to plenty of rust. With the engine freed from the frame the metal work was blasted and the back-end cut off before a new hoop was welded into place. All the original welds were checked, cleaned up and repaired before it was off for a new coat of black. 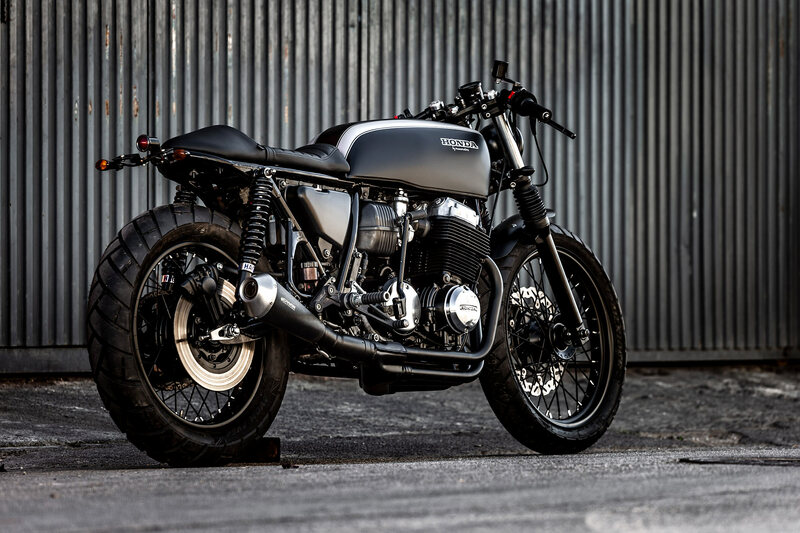 With the bare frame set aside the pair was keen to pull the old SOHC engine to pieces and play around with the classic Honda Four. True to word the inside showed only the sort of wear you’d expect from a low use bike but to be sure a full rebuild with replacements for all the tired old gaskets and seals was done. 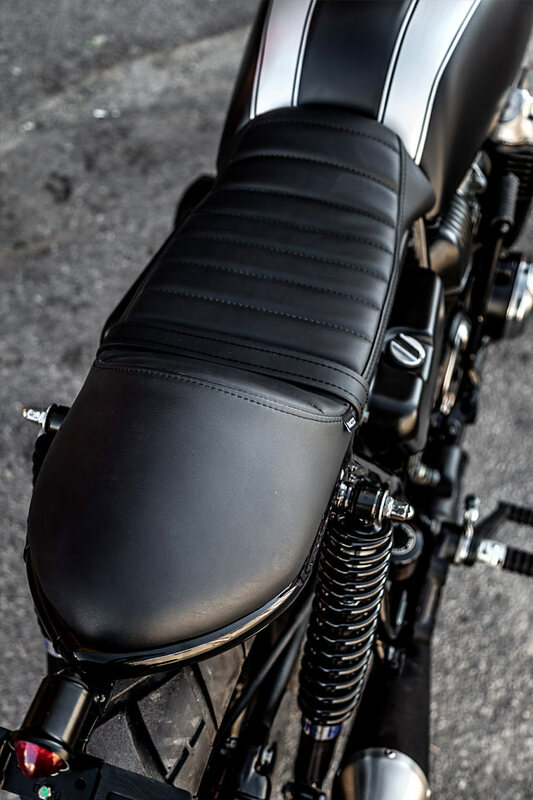 The block and barrels were treated to frame matching black while all the covers were restored to a stunning shine. Finishing it off nicely is a Spark muffler adapted to the factory headers for a little modern touch. 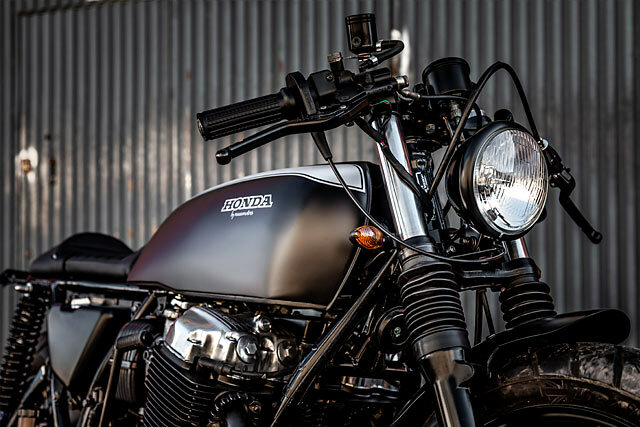 Adding a little more from the 21st century the boys needed a replacement for the rusty old forks and having worked on an endless array of new Triumphs they had just the thing. In near new condition, while still being a conventional fork, the full Brit front end provides the right look and a hell of a plush ride. Braking capabilities take a leap forward too with the new caliper clamping a floating disc for excellent stopping power. While out back a call to Hagon had a set of their shocks on the way to balance out the ride. 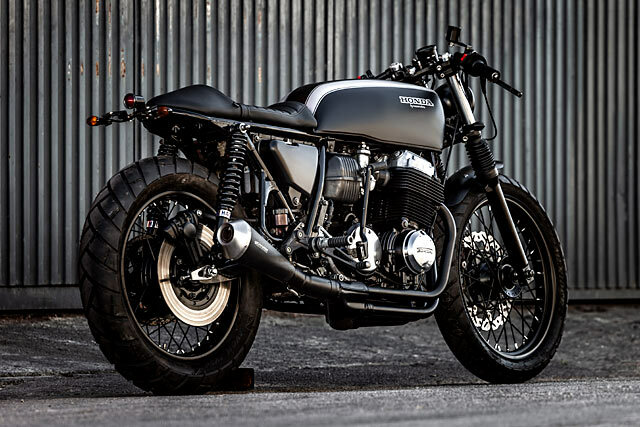 The aesthetics are typical of what we have come to expect from Macco, good clean lines, no fuss and a slight brat attitude. 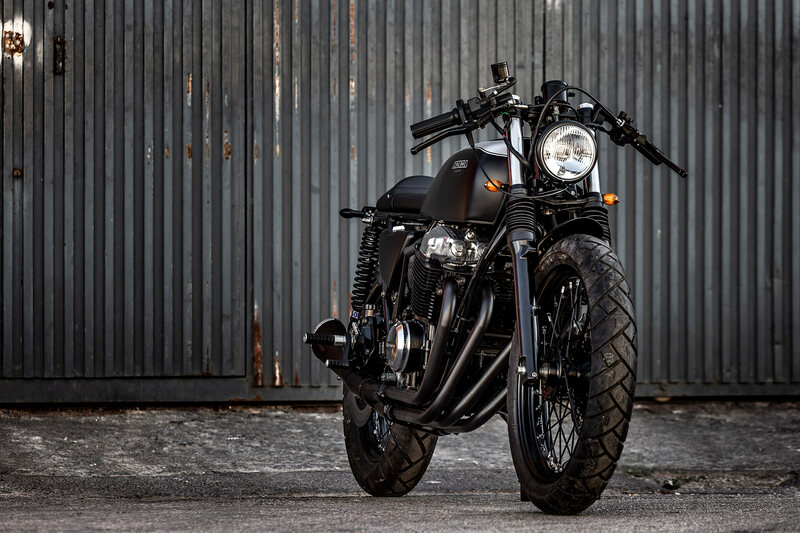 Over the front wheel is one of their blade fenders that along with the gaiters are also part of the Triumph swap. 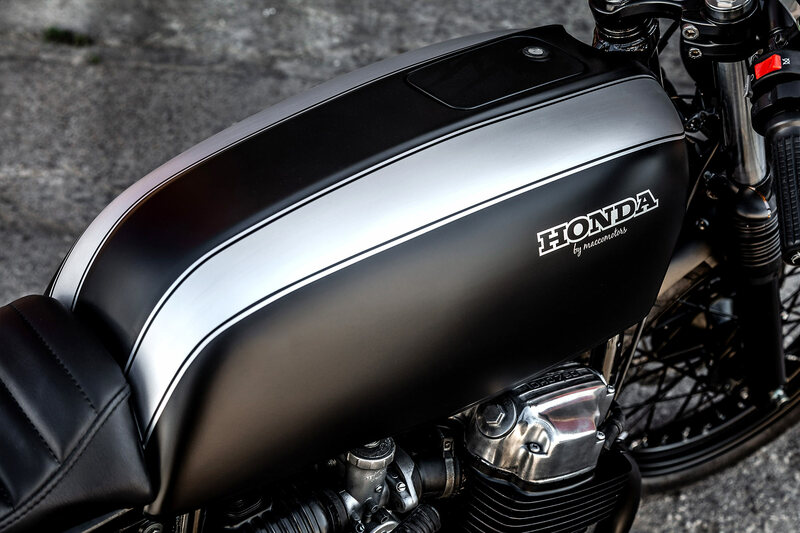 A new side panel was made for the left that matches the oil tanks distinctive shape on the other side of the bike. 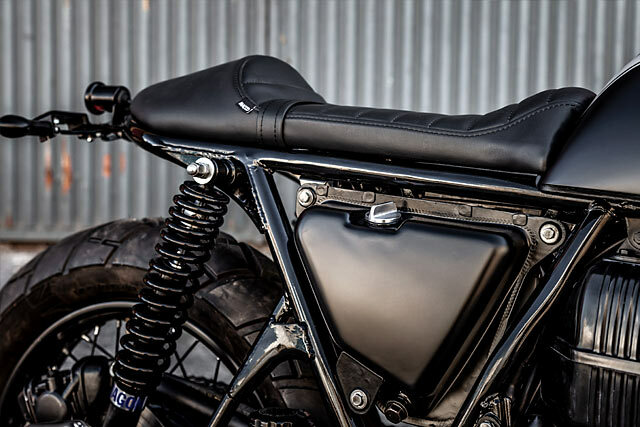 While a full Macco made cafe style leather seat bolts down to the subframe for the perfect look. The factory tank needed a little straightening before the matte black and slick silver graphics were applied for a dark and stormy feel. Always about the riding experience and with a love for twisty roads, Jose and Tito, wanted to make sure the prospective buyer would be locked in place. LSL clip on handlebars get the rider’s weight forward, resting on a set of Motogadget grips. 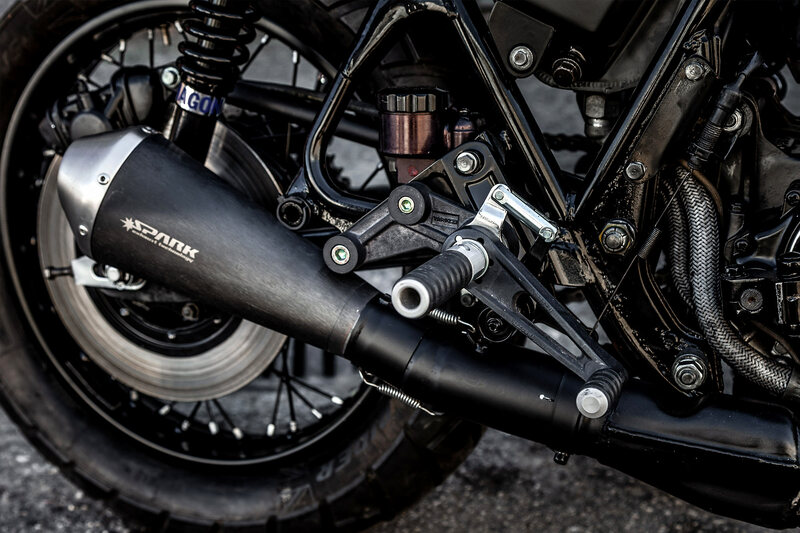 While the more sporting riding position was further accentuated with the fitment of Tarozzi rearsets. 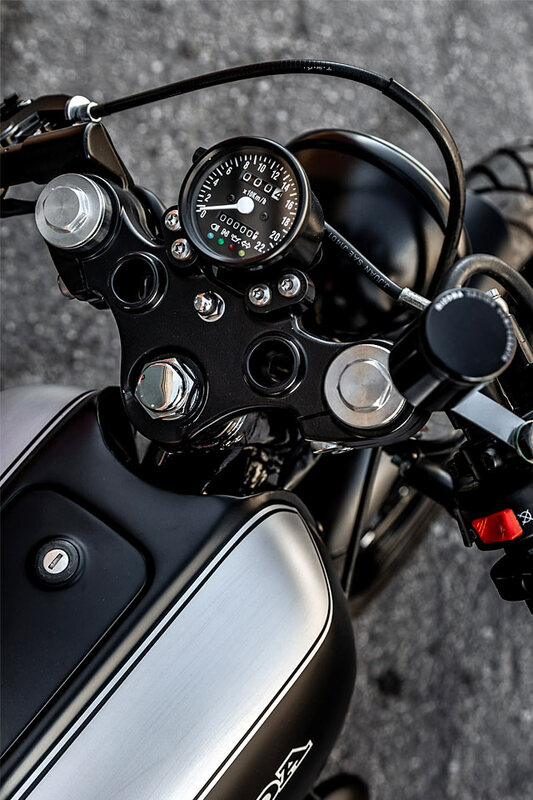 Adjustable levers get the job of applying the pressure to the new master cylinder with a Rizoma reservoir and new switches tidy things up. These operate the 5″ 3/4 Bates-style headlight, new turn signals and tail light. To wrap up the build it was decided that to get the stance just right a new 19 inch rim would be fitted to the front with Avon Trail Rider rubber best suited for the surrounding roads. Then in their typical style the lads re-wired the entire bike and triple checked every nut and bolt, the only time they want a customer coming back is to tell them just how happy they are! 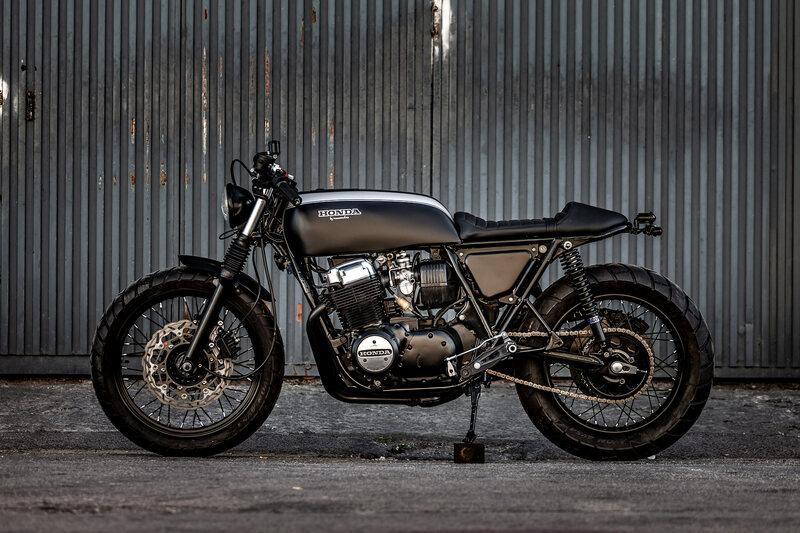 And with the purchase of Chimera another biker will join the Macco Motors ranks, a sizeable army of seriously cool customs; this Honda CB with a host of new stories to gather, finally freed from the grave of the old man’s dusty shed.